Charcot foot is a chronic foot condition that is found in conditions that cause loss of sensation in the foot, most commonly diabetes. As a result of the loss of sensation, the foot is unable to maintain its normal structure, and the bones of the foot and ankle collapse. The result is pain and inflammation. Over time, the bones and joints of the ankle can become damaged, and lead to chronic pain and ulcers on the feet. 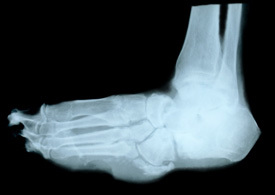 The diagnosis of Charcot foot can be made on the basis of loss of normal shape and structure of the foot and ankle. This can bee seen on physical exam, and demonstrated by X-ray or MRI. Ideally, the treatment of Charcot foot includes treatment of the underlying condition causing the loss of sensation. During acute pain, the foot can be immobilized and anti-inflammatory medication can be taken. Measures are taken to maintain the proper shape and weight bearing of the foot and ankle. As Charcot foot progresses, chronic ulcers can develop. These are painful and can lead to infection. For more information about Charcot Foot or to schedule your consultation with Dr. Shikoff, call our office in Bensalem, PA at Bensalem Office Phone Number 215-638-4446, or use our Online Contact Form.